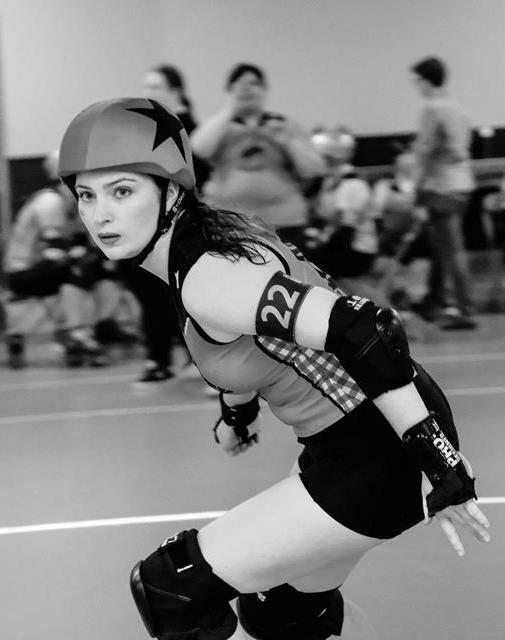 The Dashboard – This is roller derby. Want to learn more rules, skating skills, gain a deeper understanding of why you’re going to the box and see your skating role in a whole new way? Easy peasy: Put on some stripes (or a black/pink/blue shirt — I ❤ you, NSOs). You’ll become a better derby player … and who knows, maybe it will help shift your league culture (I’ve seen it happen, folks) and develop more long-term league sustainability. You also didn’t know how to play roller derby a few years ago. By knowing the game and having skating ability, you’re already way ahead of new-to-derby officials. Perhaps part of the reason you don’t know the rules is because you read the rules … and maybe you’re not a learner who absorbs words from pages into your brain. Maybe a hands-on, skates-on, whistle-on approach is exactly what you need to gain a better understanding and context of the rules. Your teammates will not yell at you in your first few times of trying officiating. If they do, you should take a hard look at your league’s culture. After you get some experience, if they yell at you, you’ll have the confidence to issue that insubordination penalty with a smile. That official will likely be happy that you’re now in a position of curiosity (unless you were abusive). Curiosity often leads to empathy. You’re about to learn how much went into someone’s call that you argued. Also don’t yell or kinda-yell at officials. I get it. But you have no idea what you don’t know about your own sport. Doesn’t that make you curious? There are few of us in the whole Roller Derby Universe who have skated every scrimmage. There are going to be times your body says, “can we please not tonight?” and when you’re smart enough to listen, remember learning to officiate is an option. It’ll strengthen you as an athlete in new ways. If you’re a member of leadership or training on your league, I’d highly encourage you to integrate officiating into your new-skater training. It’s an easy ask at that stage because everything is new, so why wouldn’t they try being a ref just like they try jumping over cones? It breaks down the fear that a lot of “older” skaters develop; thus it also breaks down the walls between your officiating crew and your skating teams. Please don’t use officiating as a punishment if you can help it. Officiating is a fun sport too. Ready? Great. Here’s how you can start learning to referee. Skater, ref … some of the same skills. That’s me as both. And, no, refs don’t usually wear arm bands, but hey. Style points. Photos by Joshua M Hoover and Hispanic Attack — both used with permission. As my derby age ticks up, I have these unwanted thoughts more often. Adventure is worthwhile. Taking time for yourself is worthwhile. Helping other people find joy, sport and adventure is worthwhile. You’re worthwhile. Heck, I’d pay that $2,000 — in my case at 7.5 years, closer to $3,000 — and 3,300+ hours any day for the friends I’ve gained alone. Never mind the 3,300 other lessons derby have given me. *A lot cheaper than whatever doctorate you wanted. Feature photo by Jim Vernier, used with permission.